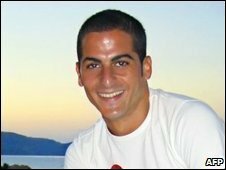 The leader of a Paris gang has been sentenced to life in prison in France for the torture and murder of a Jewish man, Ilan Halimi, in 2006. Youssouf Fofana, 28, the only member of the Barbarians gang facing a murder charge, will serve at least 22 years. Mr Halimi was held by the gang for more than three weeks before being found by a railway line. He was handcuffed to a tree, naked and severely burned. His death prompted mass protests in France against anti-Semitism. 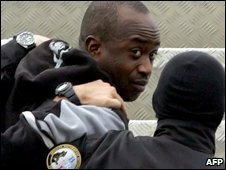 Prosecutors had asked for the maximum sentence for Fofana - the life sentence means he must serve a minimum of 22 years. The Associated Press reported that he mimed applause when the verdict was given. Another 26 people faced charges over involvement in the crime and received sentences ranging from six months to 18 years in prison. Fofana's two main accomplices received sentences of 15 and 18 years respectively, while a young woman who lured Mr Halimi to his death was given nine years. Two other defendants were acquitted. Some of those charged were minors so the trial was heard behind closed door, against Mr Halimi's family's wishes. Mr Halimi, who worked in a mobile phone shop, was lured by a female gang member to an empty apartment in the Parisian suburbs in February 2006. When he arrived, he was attacked and drugged. The kidnappers tried unsuccessfully to extort a ransom of 450,000 euros ($600,000; £405,000) from his family, sending them harrowing images and video recordings. Fofana, who is of Ivorian descent, is said to have targeted Mr Halimi because he believed that "Jews are loaded". After the murder he fled to Ivory Coast, from where he is reported to have made death threats to Mr Halimi's family. He was extradited to France in March 2006 to stand trial.